As a member-funded non-profit ministry, we depend on each other to pay the bills of our state-of-the-art website and keep adding to our creative collection of lessons, ideas, and resources. Become an annual Supporting Member for $45. Make a special donation using our "Network for Good" online donation form. We are 100% funded by the generosity of individuals and churches who believe in creative teaching resources and the unique way in which we are sharing them. We are proud that our content is not paid for by advertisers, denominationalism, and publishing demands. We love being an archive for great ideas and lessons -- waiting here for you to discover them over the years when you need them. We feel compelled to create lessons and resources that meet our high standards for creative teaching, and show others how to as well. Frankly, we think every denominational publisher should be like rotation.org, and until they do, Rotation.org is here for you. Learn more about us and our history. Collecting, maintaining, storing, and creating content does not come cheap. Our community platform is state-of-the-art -- allowing everyone to contribute content, and letting us store every good idea whenever and wherever you need it. Doing so takes paid tech and teaching support to supplement the hours and hours of time put in by our volunteers. To make it all happen, we need Supporting Memberships, as well as a group of individuals and churches willing to go above and beyond. These "super sponsors" give anywhere from $50 a year to a one-time gift of $1000. Together, all our supporters are not only providing great resources to their own church, they are also helping thousands of struggling churches and under-funded teachers in far-flung places. (Japan, Australia, Singapore, South Africa, Puerto Rico, Colombia, and more! To become a Supporting Member and make your annual, automatically renewed membership donation, mouse-over your Profile name on the Big Menu Bar at the top of this page, then click on "Membership Status." You can also click here to become an annual Supporting Member. Click here to start our Special Over and Above Online Donation process using the NetworkforGood service. revolutionary ministry to Christian education! Rotation.org Inc. is a 501(c)3 non-profit. We are governed by an all-volunteer Board of Directors. 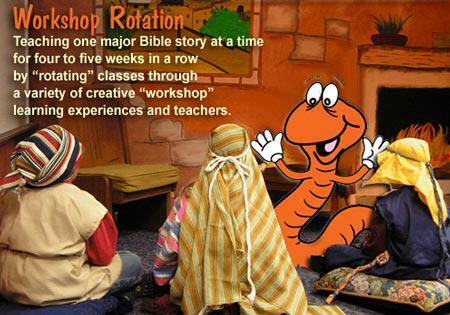 Supporters and visitors here at Rotation.org come from many different types of Sunday Schools and churches. We're thrilled to be a resource to many!